Update: Thanks to the thousands of readers who took advantage of our opening week special – the discount is now over but the e-book and special bonus mentioned below is still available at the affordable price of under $20. Today I’m really excited to announce the official launch of the first ever DPS downloadable ebook – The Essential Guide to Portrait Photography. Whether it be casual photography of family or friends or more formal portrait work – it is people that are often what our cameras are focusing upon. This guide is all about helping you to maximise the results and take portraits with a WOW factor next time you see a person through your viewfinder. Since starting DPS back over 3 years ago we’ve written hundreds of posts on the topic of portrait photography. One of the questions I’m asked the most by readers is for a condensed version of these posts – something that will help them get to the meat of the topic in a logically ordered way. This downloadable ebook is a combination of our best posts from the DPS blog (updated for this edition) as well as newly commissioned (and never previously released) tutorials. See a full listing of the topics covered here. 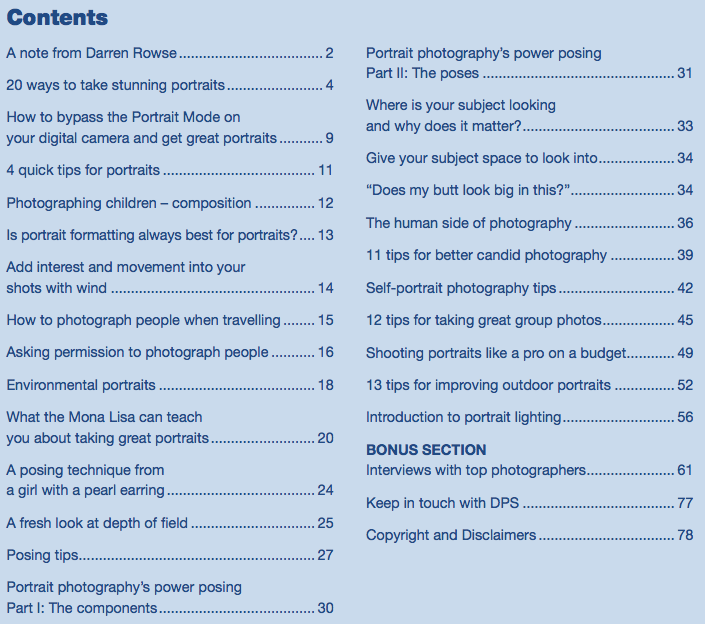 The first section pages of The Essential Guide to Portrait Photography are largely ‘how to’ in nature. While the teaching is practical and meaty (we believe you’ll get a lot out of it) we’ve also put together a further 17 pages of interviews with some great portrait photographers. Each of these photographers gives practical tips and more importantly – they each show us at least one of their favourite portraits and talk us through how they achieved the shots. To celebrate the launch of our first ever e-book and to thank you for being a part of our community we’re launching it with a special 25% discount for one week only. Normally $19.95 (USD) we believe this resource is real value for those who buy it – but with the discount you’ll be paying under $14.95 (USD) this week. The price will go up at the end of the week so make sure you don’t miss the special price. Note: during the checkout process PayPal gives you an option for a Discount code – ignore this as the 25% off has already been applied to the price. Click here for a visual of what to do. We’re so confident that this is an ebook that will help you that if you’re not satisfied that The Essential Guide to Portrait Photography ebook is helping your photography within 30 days of purchase just let me know and I’ll refund your money – no questions asked. Make sure you take advantage of the 25% discount by securing your copy of The Essential Guide to Portrait Photography today. hi Julie - please email our support team via our contact form and they can help you. They'll need to know the paypal email address that you used in the purchase to be able to track it down. Hi Darren! I purchased this last July and I still have the receipt on my husband's email but not the link where to download it. Im not sure if he accidentally deleted it or what but Is there any chance to get the link again or I have to buy it again? Thanks..
Hi Wendell - to read them on your ipad you need to download them to your computer and then upload them to a pdf reader (like GoodReader) as they're not viewable in the iPad's iBook application. Will email you with more details. When I add the book to my cart I am being asked to pay $19.95. Why is the discount not being applied? I came across from one of your other sites - I too have an interest in digital photography, thanks cant wait to read the book sounds like it has already been a great success. Great! Any plan to release in PRINTED version?? I just want to bring it with me wherever I go. I can pay for double or triple of the e-book price. Worth to have and it in a real book feeling. Congratulations on the release of your e-book Darren. As someone in the business myself I think that you have done a marvellous job. Fantastic e-book. I didn't think twice when I got Darren's email. I read it once & hope to put to practice some of the tips in the coming holidays. I would definitely take this book at a Christmas present. I think my weak point in portrait work remains my posing skills....which is why I specialize in candid style! Juste one word about the book: WOW! Oh, and a second one: Thanks!!!! this is fantastic - downloaded it this morning and spent most of the day dipping in and out of it and am inspired to get out this weekend and take some portraits. This is classic DPS - really the best of the best and what I love about this site. It's a bargain at $14.95 - hell, I'd pay double that, partly for the content and partly as a thank you for all the years of great teaching you've given us for free. Thanks - I'm going to buy a second one for my Dad who just got his first digital camera! I'm so honored to be part of the book and so proud of Naomi for the spectacular work she did on the design. Photography is a visual art, so I think it's important for the book to look good, and it really does! The Essential Guide to Portrait Photography E-book seems to be good, but i think that the "30 Day Money Back Guarantee" is not necessary! Oh nice. Maybe I'll get this once I get back from work. Thanks! Sorry for the typos. I hit submit prematurely. I can spell "portrait" and "photographer." Great e-book. Straight to the point tips and techniques for the beginner/intermediate prtrait fotographer like myself. Very nicely illustrated with photos and lighting diagrams. Will make a great reference as I commit the information to memory. Well worth the price. Also a good way to support the web site. Thanks for spreading the knowledge. Thank you for this book, I'm looking forward to reading it, and reviewing it on my blog.